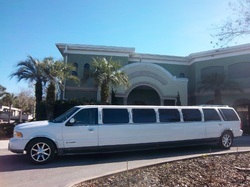 The Navigator Stretch Limo is the ultimate for epic luxury limo service in Lakeland, FL. This exciting and decked out limo has state-of-the-art technology, impeccably beautiful interior, and comfortably seat 16 to 18 lucky passengers. No matter the event, if you want to take it to unforeseen levels of royal luxury, this Lakeland limo rental is the right call for you. It is surprisingly affordable, and will make your event simply unforgettable. So whether it is a Bucs game, a girls night out, the Gasparilla festival, or your huge bachelor party, our Navigator will make things extra special.